Who Really Raised the Flag on Iwo Jima? HomeDailyWWIIWho Really Raised the Flag on Iwo Jima? For over seventy years, Marine Corps misidentified two men who raised the first flag on Iwo Jima. The Marine Corps announced this Wednesday, August 24, 2016 that it has revised the identification of two of the men who raised the first flag on Iwo Jima. 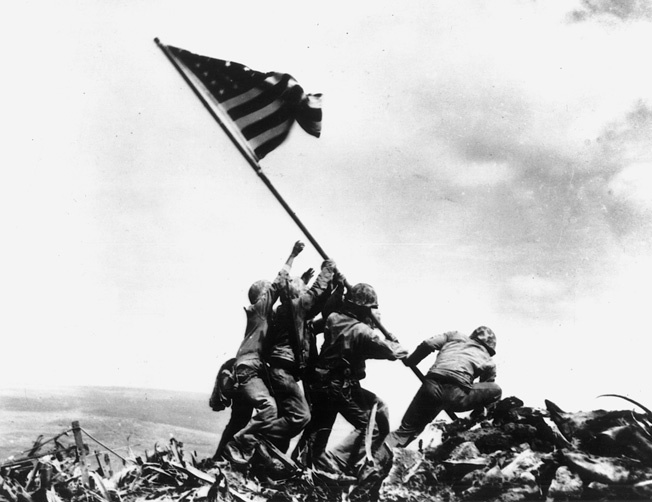 The dual flag raisings on Iwo Jima have made identifying the individuals involved in each a source of confusion. Compounding this is the fact that Joe Rosenthal, the photographer who took the famed photograph of the second flag raising, never recorded the names of his subjects. It was weeks later that any names surfaced, by then some of these men had already been killed or wounded in action. The most recent statements by the Marine Corps revealed that Pharmacist’s Mate 2nd Class John H. Bradley (the only non-Marine in the photograph) and Pvt. Philip L. Ward were misidentified as Pfcs. Louis C. Charlo and James R. Michels in photographs of the first flag raising. Charlo was thought to be the soldier second from the left, gripping the flag, while Michels had been misidentified crouching forefront equipped with an M1 Carbine. In June of this year, the Marine Corps revealed that it had also made a mistake identifying the soldiers in the photograph of the second raising: Pfc. Harold Schultz had been misidentified as Bradley. The error was noticed initially by retired Marine Sgt. Maj. James Dever as he advised on the Clint Eastwood film Flags of Our Fathers which traced the experiences of the six men who raised the second flag on Iwo Jima. The truth about the identities of the soldiers was then revealed in 2014 by amateur historian Eric Kelle when he published his detailed analysis of the photographs on his blog. The Marine Corps then initiated its own investigations into the photographs, leading to the revelations in June and this Wednesday. 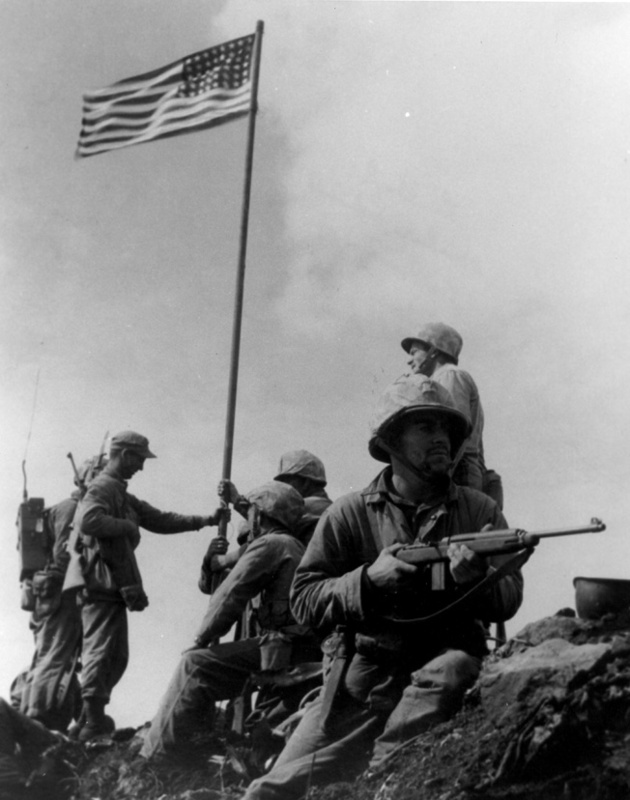 The second flag raising, in which Marines replaced the first flag with a much larger one, would be the one immortalized forever by war photographer Joe Rosenthal’s famous picture. The striking poses of the Marines planting the flag as it rippled in the violent winds of Iwo Jima captured the struggle in the Pacific for the American public. It has since featured prominently as a symbol of honor and sacrifice for the men of the Marine Corps. The statue of the Marine Corps War Memorial in Arlington is a direct copy of the photograph. The roof of the National Museum of the Marine Corps in Quantico, Virginia was also designed in its likeness. Tags Allies, Battle of Iwo Jima, Iwo Jima, James Forrestal, Joe Rosenthal, Pacific Theater, United States Marine Corps.